A good logo is hard to come by. I love the logo of Korean National Park Service. It’s simple, beautiful, has elements of complexity to it, and makes a simple statement: land of mountains and sea. The mountains and the sea are sources of life in Korea, from the resources and farming found on the edge of the mountains, the peace found hiking and visiting temples in the mountains, to the resources and seafood found in the sea. More to the point with KNPS, many of the national parks lands are reserves of mountains or protected ocean. Today we will look at the second word in our mini-series on Korean words (see the first here): the Korean word for mountain: san. 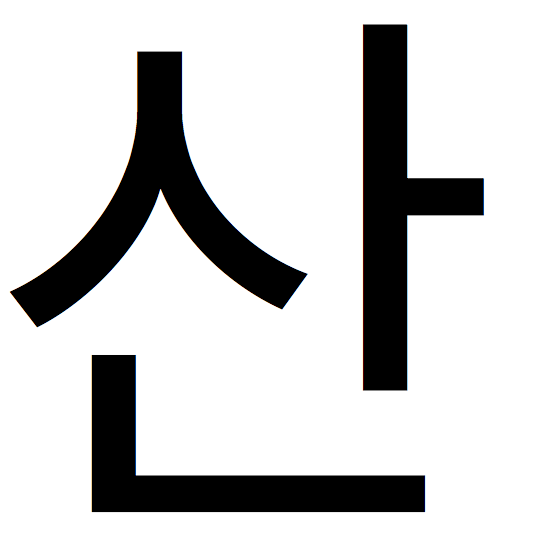 Look to the individual characters that make up the syllable, and we see ㅅ(s),ㅏ(ah),ㄴ(n). This is a simple enough word. As Seoul is surrounded by mountains, you will encounter san as a syllable in many contexts. Take for example a mountain to the north of Seoul, Bukhan Mountain, or Bukhansan: 북한산. This name mirrors one of the names of North Korea: Bukhan. Buk means north, Han is the river that flows through Seoul. So the full name is “Mountain north of the Han”. Buhkansan 북한산 is also the name of the national park that contains the mountain it is named for. If you visit Seoul for FOSS4G, I highly recommend a hike in the mountains. It’s a rare megacity and capital that contains a 30 square mile national park inside its boundary. If you do visit, I recommend doing so during the week — weekend visits are very busy.